Thanks for your Free Report Order! Congratulations on scooping up this FREE REPORT. Check your email right now and you’ll find a personal message from Debra Gould with the download link to grab your copy. We know you’ll enjoy the 10 behind-the-scenes stories of regular people who followed their dream of using their creative talents to become home stagers. It’s a quick read and you’ll find it inspiring. Be sure to look inside for a surprise gift! This free prize is worth way more than anything you’d find at the bottom of a cereal box and will put you well on your own way to making money in home staging. You’ll find it inside your copy of the Free Report you just ordered. In addition to your copy of Ask Staging Diva: Can a Regular Person Like Me Become a Home Stager? you’ll be receiving a complimentary subscription to Debra Gould’s monthly newsletter called Staging Diva Dispatch. It’s filled with home staging business tips, photos of home staging projects and profiles of home stagers. Staging Diva Dispatch is a $79 value and you’re getting your monthly subscription absolutely FREE! Don’t see our email with your Free Report? Please take a peek in your Spam or Trash folder it could be hiding in there! Then make sure you “white list” debra@stagingdiva.com so you won’t miss our emails. If you need help with how to add an address to your white list click here. Home staging expert Debra Gould writes a blog, Home Staging Business Report. In it she shares 2 or 3 articles a week about home staging as well as job postings. Check it out for free and join the community. You’ll find lots of great comments from both new and established home stagers at Home Staging Business Report! 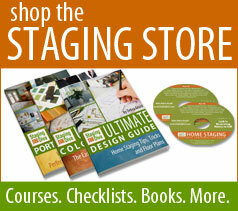 Ready to learn more about home staging courses? Staging Diva offers a comprehensive home staging business training program as well as books, checklists, coaching and more. Visit the Staging Diva Store for an overview of what’s available to help you learn how to follow your dreams and make a living as a home stager. Thanks For Your Free Quiz Order!